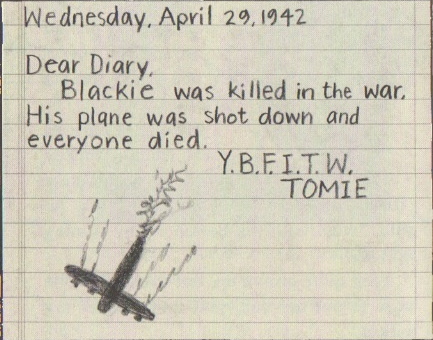 Last year, Tomie dePaola won The Society of Illustrators Lifetime Achievement Award and his extensive interview with Lee Wind on the SCBWI blog reminded me that I still haven't read Tomie's books about his home front experiences during World War II. He wrote about them in the last four of the eight books that make up his 26 Fairmount Avenue series, subtitled The War Years. As the dePaola's listen, along with the whole country, to the radio announcer talking about the attack on Pearl Harbor, Tomie's mother says to her family, "Things will never be the same." 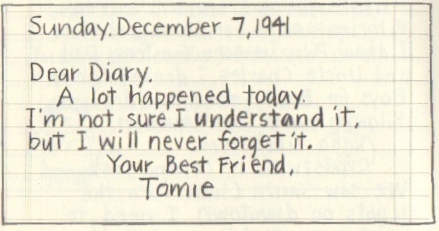 Unlike Things Will Never Be the Same, which covers a whole year, Book 6, I'm Still Scared, diary entries only cover one month, December 7, 1941 to December 31, 1941, but is is a powerful month for second grader Tomie. Not quite understanding what has happened and the implications of war, Tomie is a scared little boy and to make matters worse, no one really wants to explain what's going on to him. Luckily for him, after listening to Roosevelt's speech on the radio, the family go to visit Tomie's grandparents and his grandfather, Tom, takes some time he talk to him about his fears. But life had indeed changed. At school, there were air raid drills, and at home, an air raid shelter had to be created in the basement just in case. And Tomie had to contend with being called the ENEMY because of his Italian heritage. War was everywhere. Even at the movies showing a children's feature, the newsreels showed London in the Blitz, and Tomie realized it was the first time he had seen what war was like. At the end of December, young Tomie is still scared. 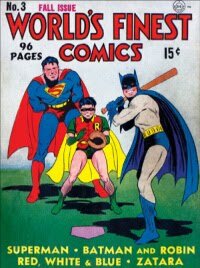 Book 7, Why?, begins on January 1, 1942 and runs until April 29, 1942. In his new diary, Tomie gives more details of his day to day life. He writes about his excitement about being able to stay up late for New Year's Eve, of going to help in his grandfather's grocery store, and of his first surprise air raid drill at school. But his real trouble comes when his teacher starts teaching the kids to write in cursive and refused to allow Tomie, a lefty, to hold the pen in a way that worked for him. And Tomie talks more about his older brother Buddy and how angry/annoyed Buddy gets with him. But perhaps saddest of all are the entries about his cousin Anthony A/K/A Blackie. Blackie was a favorite cousin who had joined the Army Air Corps. Tomie seemed able to adjust to everything involving the war - like rationing and air raid drills - but the news of Blackie's death is just incomprehensible to him. In the end, he is left asking himself Why? Book 8, For the Duration, is the final book in the 26 Fairmount Avenue series and begins on May 1, 1942 and runs through... Well, that's hard to say. It seems that early on, Tomie's diary key disappeared. While there are not more diary entries, Tomie still talks about his life and in 1942, patriotism is in full swing. At school, Tomie gets very sad and runs out of the room when the class starts singing the Army Air Corps anthem. At dancing school. there is a lot so rehearsing for a wonderful recital, but there are also bullies in the schoolyard who take his new tap shoes and start tossing them around. And there are victory gardens and ration books and helping again in his grandfather's grocery. Things between Tomie and his brother Buddy get worse and in the end, it is Buddy who has taken the diary key. But one thing Tomie learns to understand completely is that some things disappear (chewing gum, fireworks) and other thing come into being (war bonds, war stamps), all "for the duration." The 26 Fairmount Avenue series is an extraordinary group of chapter books recalling Tomie dePaola's early life living in Meridan, Connecticut. For the most part, they are a series of vignettes told in great detail and include whimsical illustrations by Tomie thoughout the books. Much of what Tomie writes is funny, charming, sad and so typical of kids that age. Though I haven't reviewed for first four books here, I would really recommend the whole series to anyone who is a Tomie dePaola fan. My only gripe is that we are left hanging about Buddy and the diary key. I love this series! And thanks for sharing the interviews - such a delightful man with so much to share about the writing process. I also love this series and I love the illustrations that are included. Tomie dePaolo has added so much to the enjoyment of children's books and really knows how to speak to kids in them. I really appreciate your post this week. Somehow, I've missed keeping up with this series. The Doucette has the first couple at that's it. Thanks for participating in this week's Nonfiction Monday. This is really a wonderful series and the content is still very timely for kids. I live in CT and had no idea about these books. I am looking them up tomorrow. These sound like books that some of my 5th graders will be able to enjoy during our HF unit. They need books on all levels. Thanks for sharing. Yes, they probably would be good for some of the kids you have. I used them in my 4th grade class for the readers still on chapter books and even though they take place in the 1940s, the kids still liked and related to them. Oh my goodness, I had no idea this series existed. We love dePaola here! (My daughter is only 3 so we haven't gotten to chapter books yet) Thanks for this post! I love it, "This post probably contains spoilers." In all seriousness, this sounds like a fascinating series. Thank you so much for sharing. How powerful! I love what you are doing with your blogs Alex. I just read Birdsong by Sebastian Faulks and it made me realize how our kids' generation are so far removed from the horrors of the World Wars, the lessons we've learned from them, and the implications for the present and the future. What a precocious 6 year old to be writing in a diary (with waaaay better handwriting than my son, can I just say!) about his thoughts around such complex issues.